Japanese troops in Iraq are banned from using alcohol, eating pork, and they are recommended to grow moustaches “to resemble local residents”. “We have studied the traditions of Iraqis”, said Head of Japanese Defense Administration Sigaru Isiba. “Everybody serving in the Middle East must respect Islamic culture and religion”. Japanese military seem to have taken their command recommendations very seriously. National television covering deploying Japanese troops in details, many times broadcast the images of the leading Japanese self-defense force unit where its commander Colonel Masakhisa Sato with “Eastern stubble” was shaking hands of the local authorities representatives. Japan plans to deploy about 1000 servicemen (including doctors and engineers) in the Persian Gulf area. For the first time after World War II Japanese troops are deployed to the scene of military conflict. 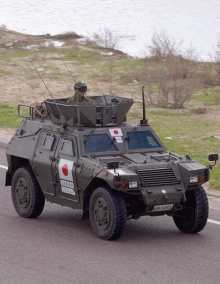 Japanese authorities repeatedly state that their mission is providing Iraqis with humanitarian aid – filtering water, supplying medical treatment, rebuilding schools. The personnel of the Japanese unit is banned from using weapons except for self-defense.